Terri Ayanna Wright (Baton Rouge, Louisiana) obtained a BFA with honors from Fordham University and The Ailey School, through which she performed with The Alvin Ailey American Dance Theater and works by Hope Boykin, Matthew Rushing, Martha Graham, and Nathan Trice, and Astrid Von Ussar. She has also studied at The Alonzo King LINES Ballet Summer Intensive on merit scholarship, as a recipient of the Homer Avila Award. After graduating with a dual degree in dance and computer science, Ms. Wright toured domestically and internationally with Ailey II, under the artistic direction of Troy Powell. 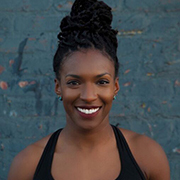 Since completing her seasons with Ailey II, she has performed with Buglisi Dance Theatre, and is currently a founding member and the company manager of MATHETA Dance, a project-based afro-modern dance company with the mission to ‘speak through movement.’ Ms. Wright joined Carolyn Dorfman Dance in the Fall of 2017, currently in her second season with the company. When not performing, she enjoys choreographing, creating dance visuals, and teaching Horton as an instructor with The Ailey Extension.